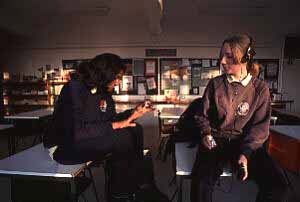 These photographs were taken for a documentary project about Inner London schools. The project was shown as part of a photographic exhibition in Brentford, West London. 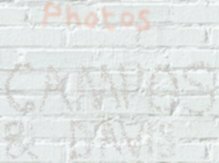 These pictures, and pictures of other schools we have photographed, are now availbale to educational publishers through Collections picture library (See our links page for details of our agents). 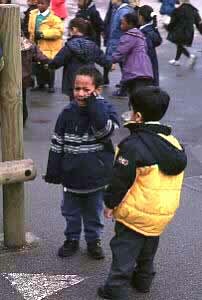 * Left: Play time in a inner London school produces tears for one little boy. 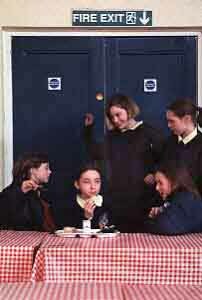 * Far left: Lunchtime joke for these high school girls. 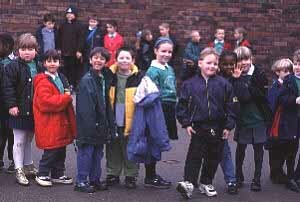 * Above: Line of 6&7 year old's at playtime at an inner city infants school. 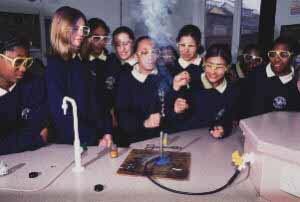 * Above: A science lesson with a surprise for a group of 4th year girls when the magnesium power goes flash. Click here to see our CV's page including portraits of us!